Sarah Wilson is an Australian journalist, television presenter, blogger and media consultant. She was the editor of Australian Cosmopolitan magazine until 2008, and the host of the first season of the cooking show, Master Chef Australia, in 2009. Sarah is the author of the Australian, US and UK best-sellers I Quit Sugar and I Quit Sugar for Life, and has authored the best-selling series of ebooks from IQuitSugar.com. Her 8-Week Program has seen more than 400,000 people quit sugar. 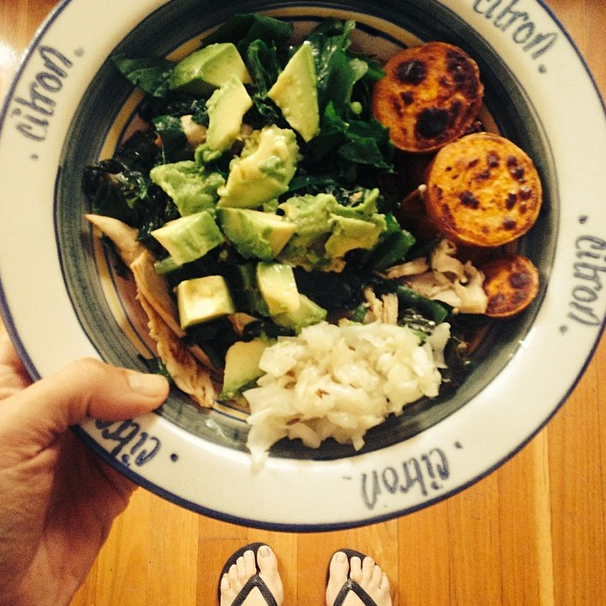 She is a qualified health coach with New York’s Institute of Integrative Nutrition. Libby O’Loghlin asks Sarah about her writing habits, her publishing experience, and how she measures success. Sarah Wilson at work. Image courtesy Sarah Wilson. From the outside looking in, you tick a lot of ‘success’ boxes: New York Times bestseller, a gazillion followers on your various social media channels … you’ve interviewed the Dalai Lama, Australian Prime Ministers, Gwyneth Paltrow … How do you measure success in your life, and has it changed over the years? I won’t pretend that some of those ​’highlights​’ have certainly instilled me with some incredible satisfaction and also confidence. However, some of the big bombastic milestones were achieved during a time in which I felt very much out of alignment and so I almost dismiss them. When I do something and I feel in alignment, then I feel I’ve succeeded. There’s an Ayurvedic word—dharma—which describes both what you do and also your destined contribution to life. When the two are aligned you’re in your dharma. This is success. Your writing has a very distinctive ‘voice’ and tone—which is sort of like the Holy Grail for writers (of any ilk). When did you first realise you were good at communicating ideas? And was it a long process to find your own particular voice? My Mum says that from a young age (8) I told her I was going to be someone who shared important ideas. For a long time I thought I’d be the first Prime Minister of Australia. I’m certainly glad that didn’t transpire! I think I developed my voice during my tortured teens. I used to write letters to a good friend at highschool (we’d swap them at lunch) and a few years back we gave each other each other’s letters to read. I realised my voice hasn’t changed at all. One discovery that I came across via blogging was that my voice is most authentic when I​ ‘dig down​’. When I really submerge into the present moment and feel what I write. I often find this is when I’m in an discordant place—like on a plane, or in a doctor’s waiting room. And it happens best when I’m slightly melancholy, premenstrual and when I handwrite. Having worked your way around the Australian TV and print media for 20 years as a journalist, TV host and magazine editor (Channel Seven, Foxtel and News Ltd.), how do you see the traditional, institutionalised media outlets’ roles in the current ‘mass content’ environment, given that the traditional models of publishing and ideas about freedom of information are shifting? The value of trained journalists with something substantial to say will never disappear. Indeed, as journalism has been ​’cheapened​’ by the mass content environment, their value and skills become more important. I don’t fear that real news will suffer from the aggregation of content. If anything, I think it will lead to real news’ moment in the sun. We will soon tire of bodgy, mass-produced content and the great thing about online news consumption—it’s so easy to abandon the frauds or those with nothing substantial to say. It simply requires a quick unfollow. I observe that the talented writers and news content providers rise to the top in the social media fray. The challenge is for the outlets/publishers etc to recognise this and to allow their journalists to become ​’brands​’ and to come up with innovative ways for the good content to be shared. I self-published two ebooks—I Quit Sugar and the I Quit Sugar Cookbook—​i​n response to reader requests for all my research to go in the one spot. I noticed your first digital IQS book has no imprint. Did you put this version out as an independent publication, or did you have a publisher partner? And how did you make the decision about which digital formats to supply for your readers? It all evolved organically, and a little back-to-front. So no pragmatic decision was ever made as such. I self-published two ebooks—I Quit Sugar and the I Quit Sugar Cookbook—​i​n response to reader requests for all my research to go in the one spot. After seeing the success of the ebooks, pbook publishers came knocking. We effectively combined the two ebooks into one pbook. You’ll note I’ve not released an ebook version of the book that Pan Macmillan (my pbook publisher) put out. Funnily enough, this approach has worked really well. A lot of the ebook buyers bought the pbook. And vice versa. My approach now is to produce ebooks that focus on particular topics touched on in, say, my second ebook. So I have ebooks covering chocolate, kids recipes, slow cooker recipes, Christmas recipes … a sample of each which feature in the print book. If that makes sense! I know some in traditional publishing are a bit confused and challenged by it all. But since it works, and both media feed into and off each other, my publisher has been really happy to continue this approach and has not insisted on e-rights to the books. The Hachette/Amazon debacle in June this year has thrown the issue of DRM (digital rights management) in the book publishing world into relief, as ‘traditional’ publishers come to grips with the immense power Amazon has as a distributor and also as a publisher in its own right. (Cory Doctorow’s overview in The Guardian here.) You now have a publishing partner for your IQS books, but how important is it for you to sell your books directly from your website (as you have been doing since the beginning)? I think I kind of answer this above. And actually, it’s my philosophy for media in general—if you have a strong, researched, authentic message, the best idea is to distribute via as many outlets as possible. You can’t just write an article and get paid to have it published in one outlet. Nor can you simply write a book and expect it to sell on its own. You’ll never earn enough to eat. Which means placing all your eggs in one publisher/outlet basket doesn’t work. You have to spin a whole bunch of plates at once. And it’s best if you do it yourself because traditional media hasn’t really caught up to this. Sugar is an ingredient in a huge percentage of foods on supermarket shelves these days, and the sugar supply chain is muddied with politics and the strong arm of very big business. As the old adage goes, ‘the pen is mightier than the sword’—and you wouldn’t be the first writer to cross pens with powerful institutions—but, as the success of the IQS programs grows, are you ever afraid you’re going to upset The Wrong People? Big Food is very much on my radar and, I believe, I on theirs. I’m very mindful of my message and careful not to hang myself out to dry. But my message is kind of bulletproof—I’m merely advising people try quitting sugar as an experiment. I refer to the the politics and the fact that Big Food has its sticky fingers in the organisations that provide dietary advice. But I point out that this very issue means we can’t sit around for governments or organisations to tell us how to eat. We have to take charge for ourselves. Funnily, my biggest challengers are generally dieticians (who are sponsored by a sugary brand of some sort). You—and many other lifestyle/happiness and thought leaders—talk a lot about the importance of daily habits. One of the big challenges facing writers of longer projects (fiction or non fiction) is how to ‘go the distance’: i.e. reach that daily word-count, plus pump out regular content for marketing purposes, while staying physically and mentally on your game. Given that you are prolific—blogging, writing columns, engaging with people via social media, and of course writing books—do you have specific routines or habits that you incorporate into your daily life to address this ‘screen-based’ part of your job? Do you have set writing times? Yes! I have a morning routine. I’ve written about this a lot on my website. As well as in my books. A sturdy start to the day provides the right tone and pivot point. I also am quite diligent about creating my own boundaries—I turn off email to get creative work done, I set aside every Thursday for reading and researching (dense cerebral stuff). When I have a big project, I go away on a Think Week to nut out things. You give a great deal to your readers and followers in terms of written advice, information and engagement, and yet there are many writers who refuse to supply content unless it’s paid for (here’s Jane Friedman’s overview of just one example). Over the years, how have you as a professional navigated the fiscal versus social economies when it comes to investing your time and energy? And what role do you think digital media has played in (re)defining the value and roles of content? The dynamics of online are about giving stuff for free. I’m a firm believer in this and I’ve discussed before how Seth Godin taught me this lesson. When you work online (indeed, Godin says this applies to anyone creating), you give for free first. Once you have a tribe, you can then charge for aspects of what you do. I do this. I wrote a blog (unpaid) for three years before having a revenue stream. Today, my team spends 60% of the week working on content that we give for free. This is how online works, and to a certain extent writers need to realise this. Of course, it is different when your only wares are posts. But my point would be that all creatives have to think about new ways to monetise, after giving. I provide a lot of free content and have never asked to be paid for my contributions on blogs. I’ve always known this is how it works—I give out my information to build an audience. 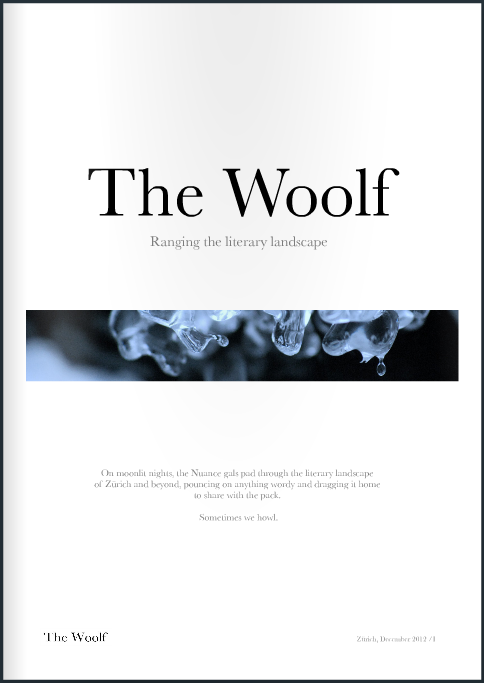 And, finally, The Woolf Special Question: What’s your favourite work of fiction, and why? I’m not great with ‘favourites​’ … in part because I’m very indecisive. But I’m going to cite an Australian book that really stuck with me—Alex Miller’s Lovesong. There’s a delicateness to the writing and a kind of ​’​sunset​’​ feel as the reader experiences two different stories—one of them a love story—through the eyes of an older man. It’s also set in an area I once lived in in Melbourne, and the way he describes the cafes and the streets is very evocative, in that raw, rustic Australian way.